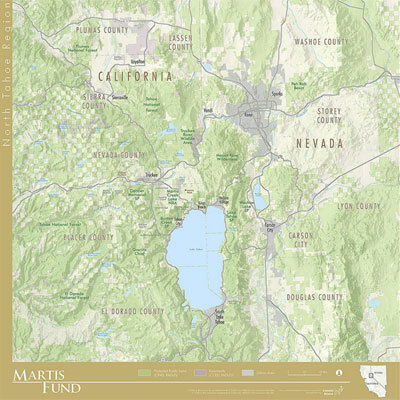 Located between North Lake Tahoe and Truckee, the 45,000 acre Martis Valley was the site of intensive negotiation over proposed development and conservation priorities during the early 2000s. The outcome of this effort was a collaborative blueprint for the future of this spectacular area. The landscape of the Martis Valley includes meadow, forest and mountain environments intermixed with urban, rural and resort development. The Valley is the largest montane meadow in the eastern Sierra between the Mono Lake Basin and the Sierra Valley, and is rich in biological diversity with a unique blend of Sierra Nevada and Great Basin habitats. 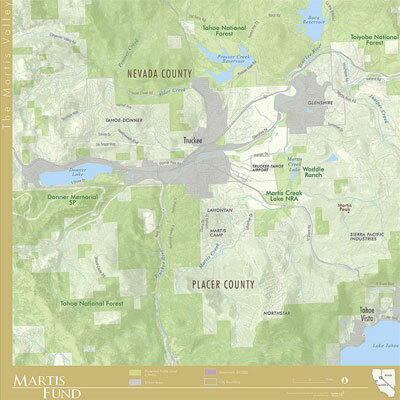 Explore the Valley and the region around it in the maps below, created for The Martis Fund by GreenInfo Network. Clicking a map opens up a zoom-able version which you can navigate using the controls at the bottom of each map window.